Looting matters, preserving matters more. 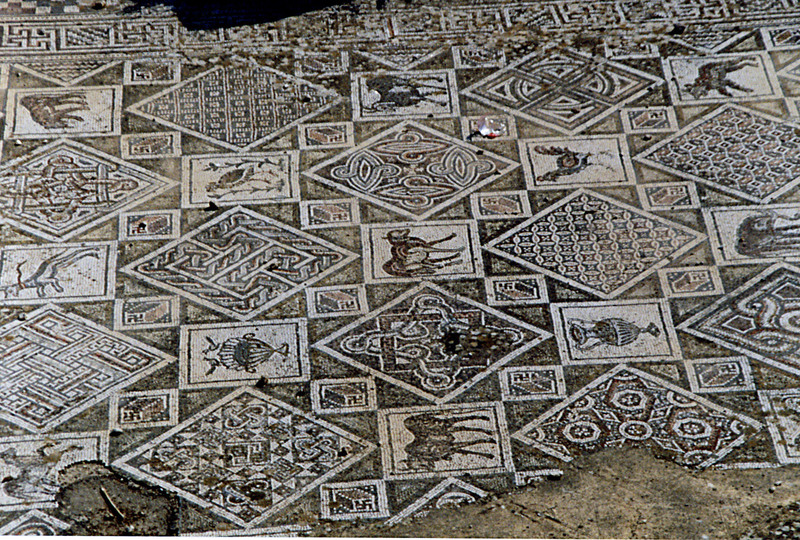 One of many Late Antiquity mosaic floors found so far at Jerash, Jordan. The mosaic floor of a yet unknown Byzantine church has been unearthed by prospective looters at Kanisat Qirmerl, near the Roman city of Jerash, Jordan. The colourful floor, measuring about 5 x 7 m., depicts men climbing up trees to hide from bears and lions. According to the inscription, which mentions the patron and mosaicist of the floor, the mosaics date back to AD 589-590. “Underneath about a metre of soil, the mosaic floor of Kanisat Qirmerl was almost perfectly preserved,” ststes Jacques Seigne, director of the French Archaeological Mission at Jerash. According to Seigne, the discovery has a massive importance for archaeology as it helps us to understand the extent to which Iconoclasm affected the production of images in the far sides of the Byzantine Empire during the 8th and the 9th century. “The discovery of this church is very important because it may add to the argument that there was no systematic destruction of icons during the Iconoclast period,” he said. “The excellent conditions in which the mosaics were found in also indicate that the church was used and preserved throughout the Umayyad period,” he added. “Looters were digging in the night and discovered the mosaics by chance,” , states the Department of Antiquities Jerash director, Rafe Harahshah top the local newspaper The Jordan Times. “The next morning one of the looters came to the DoA office in Jerash and told us about it, which is not very common… this meant we could respond quickly,” he noted. The rapid intervention by the DoA may have prevented possible damage to the mosaic floor of Kanisat Qirmerl. For the time being, the Department of Antiquities (DoA), has just concluded a 45-day rescue operation to uncover and secure the site with the help of Seigne and his team. Rescue operations such as the one at Kanisat Qirmerl entail securing the site, launching a preliminary excavation and collecting data to be presented to the DoA, states Ali Al Owaisi, Harahshah’s colleague. Now that the rescue operation is finished, decisions need to be made as to the protection and preservation of the site. However, the problem lays in the lack of resources both for protecting sites like this from looters as well as preservation work that comes afterwards. “We are mostly dependent on informants for information on looting,” says Harahshah, adding that “A committee within the DoA will now decide how to proceed; whether to buy the land or perhaps transfer the mosaics to a museum, depending on the available funds”. On the general problem of looting, Seigne reports, “The Kingdom has thousands of undiscovered sites which are easily accessible, so looting has always been a problem. But with the explosion of Jordan’s population in the last decades this issue has become much worse. The DoA has to be strengthened to keep up with this development”.